The PB Swiss BikeTool is a clever designed multi-tool for on the go, and I will compare it with my Lezyne V10 multi tool. The PB Swiss Tools 470.M Adapter is part of this 1/4″ bit based BikeTool. The adapter is 1/4″ bit holder that can be used in combination with a 5 mm. hex/allen key. Furthermore I will share my thoughts on why every home mechanic should have the PB 470.M Adapter and a set of PB Swiss Tools allen keys. On the front and backside of the holder a tyre lever is clicked. The PB Swiss Tools precision bits can be pushed out of the holder with the 5 mm hex L-wrench. Personally I would replace the Torx T25 with a Torx T27 bit to tighten Shimano Dura Ace 9000 chain-ring bolts. The bit for slotted screws I would replace with a 8 mm. hex bit. So you can really customize the PB Swiss BikeTool to your own needs. Although the Lezyne V10 product description states that the tools have a chrome vanadium coating, you can see corrosion happening in the picture above. And the tool is less than 1.5 year old and maybe used one time to help a cycling friend. Tyre levers are included, no need need to carry an extra set like the Tacx Mini Tyre levers. Over the past 25 years of cycling a chain breaker has saved my cycling buddies and myself a numerous times. Unfortunately PB Swiss Tools doesn’t have a chain-breaker. It’s understandable because the PB BikeTool is the only cycling specific product of the Swiss Tools firm. I would like to try and see if I can attach the Topeak Super Chain tool or the Pedros Six-Pack Chain Tool to the 5 mm. hex l-wrench (and still have a compact tool-set). 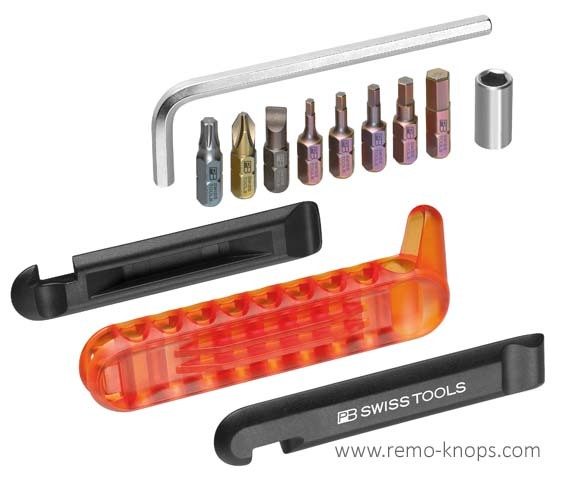 PB Swiss Tools is also known for its rainbow colored hex key l-wrenches, that are widely used by professional mechanics and local bike shops. Personally I do have a set of long allen wrenches with ball heads that is almost 20 years old, and despite intensive use you hardly see any signs of wear. So for EUR 35,- it is a rock solid investment for years. I’ve attached the PB Swiss Tools 470.M Adapter to the 5 mm hex key l-wrench, and have it in my toolbox as part of the set. It combines perfectly with PB Swiss Tools BitBox and the long l-wrenches give you a perfect reach when you put the adapter on the long side or a strong force when you put the 470.M Adapter on the short side. Only other brand that offers a similar kind of adapter is Silca in their HX-ONE Home and Travel Essential kit. Their adapter only fits the 6 mm. hex key l-wrench and isn’t sold separately. You would need to buy the complete set for a price of $ 125,– . 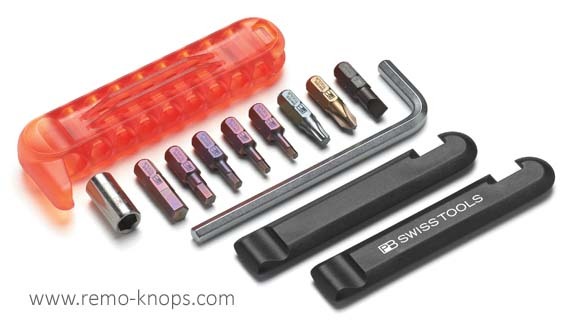 A similar PB Swiss Tools set will cost you roughly € 40,– or € 50,– In other words half the price for at least the same product quality (or even better). If you use only the PB Swiss Tools 470.M Adapter with a precision bit, you can quickly hand turn the bolts of your bottle cages that are hard to reach with a hex l-wrench or ratchet tool. PB Swiss Tools BikeTool is a clever designed multi-tool for on the go that can be customized to your own needs (you can replace the 1/4″ bits). The BikeTool has tyre levers included, I personally miss the chain breaker. Since the some tools in the Lezyne V10 are already rusted, I expect the PB Swiss BikeTool to be more durable. You can get the PB BikeTool for € 26,75 which is a good price for the high quality tool you get. The BikeTools is available in 6 different colors: black, red, yellow, blue, green and purple. A spare PB Swiss Tools 470.M Adapter will cost you € 5,05. 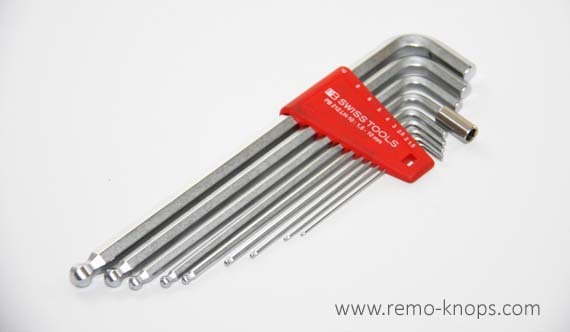 The adapter will fit perfectly with the rainbow colored hex key l-wrenches that are used by many professional mechanics. As mentioned in before I have a set of allen keys that are over 15 years old, so you can’t go wrong with purchasing PB Swiss Tools. If you are looking for a nice present for a cycling friend you may have found it. You’ve forgotten to list the all important weights! Specifically, how heavy is the 470M adapter? It looks tiny but wouldn’t be very attractive if machined out of steel. I’ve weighed the PB Swiss Tools 470.M Adapter on the kitchen scales. The weight is 8 grams and yes it is crafted from steel, which makes sense if you put some decent torque on it with the hex keys. I hope to still create a low weight custom emergency cycling kit. So if you have any tips, please drop me a comment or leave a message on the contact form. Hey!, I found this information for you: "PB Swiss BikeTool and 470 Adapter". Here is the website link: https://www.remo-knops.com/5569/pb-swiss-biketool-adapter/. Thank you.